Almost a hundred years after an unsuccessful robbery of a jeweller’s shop, an English historian continues to follow the footprints of the main suspect. Over this time the man called “Peter the Painter” became a legend. He is the most famous Latvian in London. When I finished writing my novel “Mr. Latvia” and wanted to send it in to the “Karogs” magazine for a competition, I decided that it wouldn’t be clever to go to the editors myself, carrying the manuscript in my breast pocket. It would be obvious to everyone that “Mr. Latvia” was my creation. For conspiratorial reasons I gave the manuscript to a chauffeur A., who took it to the editors’ office. The plot succeeded and no suspicions were aroused. Besides, a bit of cunning seemed to suit the book with the false identities and secret ways it described. It also suited a book about the legendary Peter the Painter (or Peter the Artist, because he was an artist as well as a house painter) and Latvian anarchists who had escaped to England from Czarist Russia and caused an unprecedented hullabaloo in the Kingdom in London in 1910. At that time I didn’t know that Peter the Painter would come back – this time not as an eerie legend, but as a real man with a name, surname and life story. After the book came out, I was often asked if anything like this had ever happened in reality. Unlike in London, in Latvia Peter the Painter had never become a tale on the scale of Kaupen, sung about in musicals. But in London to this day he is at least as well known as Jack the Ripper. “He was a Bin Laden of his time”, as an East End historian Bill Fishman put it in a slightly exaggerated way in one of the documentaries about London’s Scariest Mysteries. In any case, there are “Peter the Painter” pubs and decorating companies in London. When writing “Mr.Latvia”, I was interested by the activities of Latvians abroad - and not just any activities, but real events, which have caused a lot of noise and leaving permanent marks (results) which would remain imprinted in memory, become a legend. That is how I came to write a book about Peter the Painter, who, as I was told, “in reality probably was the artist Gederts Eliass”. Andris Mellakauls, who during his life in London collected information on his famous countryman, lent me various books dedicated to Peter (they are listed in the bibliography at the end of “Mister”). Carefully examining the photos of Peter the Painter and Eliass and comparing their biographies, it is almost impossible to believe that this is one and the same person, - but that did not seem important. I was interested in the story itself. The false identities and aliases. The man who appeared at a certain moment in history, and later disappeared without a trace, leaving behind him a lot of elaborately colourful conjectures and surmises. Mr. Ruff first came to Latvia at the end of the eighties and surprised many by his altogether insanely naïve wish to see the KGB House. From the inside. It turned out later that precisely in those days, comparing the two biographies, Philip put forward the wrong hypothesis that Peter the Painter and Gederts Eliass might be one and the same person. Still, very soon Mr. Ruff was forced to admit that this had been a mistake, because he happened to find in Riga a portrait of Peter the Painter. The same as was printed on the “wanted” posters in London. It could be said with certainty that the man seen on the poster was not Eliass. A little later photos of him were found, where he was depicted in France and the US. 1905 is the year in which the legend of Peter the Painter began. The approaching centenary of this event might be one of the reasons for an increased interest and attempts to study it without the generalisations and bias, inflicted on the readers by Soviet history books. The events in London in the winter of 1910 were closely connected with the 1905 revolution in Latvia - people seeking to escape the repression and persecution in Czarist Russia found refuge in London. Historians who have studied their activities in London are unanimous about the fact that the awful experiences of 1905 - interrogations and tortures, executions without trial could be at the basis of the (unheard of in those days) cruelty and audacity of foreign anarchists. On December 16th, 1910 an unsuccessful attempt was made to rob a jeweller’s shop in London. The robbers had rented a neighbouring house and under the cover of darkness had planned to dig a tunnel through the party wall into the shop. They were disturbed by the police. The idea to surrender did not even enter the robbers’ minds. Three policemen were shot dead, two seriously wounded. That was an unprecedented brutality, considering that the London police in those days were not armed. It is possible that this incident would never have been disclosed, if in the heat of the battle one of the robbers had not been accidentally shot by one of his comrades. The body of Hartmanis, or “Puika”, was found the next day in a flat in the East End. The documents found in this flat led the police to believe that the dead man had belonged to a fighting group of Latvian anarchists called “Liesma” [“Flame”]. The mysterious Peter the Painter, also known as Peter Pjatkov, was considered to be the leader of “Liesma” and together with Fricis Svars (a cousin of the later notorious Chekist Jekabs Peterss) had lived in this flat. The last act in this tragedy happened after a few days. The police were informed that two of these anarchists - Fricis Svars and Jazeps Sokolovs - were hiding in a house in 100 Sidney Street. This time the police took careful precautions. The whole quarter was surrounded by 750 men - police and Irish Guards, armed with battlefield rifles. Even a cannon was delivered, for there was no other way to fight those anarchists! And still the police had not the slightest experience in fighting terrorists; also their weapons, compared to the automatic Mausers used by the two fighters, were insignificant. And still the “mastermind” Peter the Painter got lost without a trace. Almost the same way as the present-day terrorist leaders do. Soon afterwards the London police arrested Jekabs Peterss, who was later acquitted due to lack of evidence against him. Anger seized the public opinion and the press: look, where their hospitality has led Londoners… It turned out that the city was swarming with armed to the teeth anarchists who had come from all across Eastern Europe and who didn’t hold anything as holy. A police historian Donald Rumbelow is absolutely convinced that it was Peterss who was the main shooter and the murderer of the three policemen. It seems that he cannot resist the idea that only the later Chekist would be capable of such an audacious crime. And, of course, the knowledge that Peters received his well-earned punishment, falling victim to Stalinist terror at the end of the 30s. Philip Ruff considers this Rumbelow’s version as pure fiction. On the photos discovered by Philip Ruff in the Riga archives, one can see a man called Janis Zhaklis, or Zhakle (in the old script Schaakle), who was born on July 19 1883 on a farm listed in police files as “Kounen” (maybe “Kalnini”?) in the district of Talsi. Some Gendarmerie accounts mention Wolmar, or Valmiera, as his place of birth. Known under an assumed name of “Mernieks”, he was a leader of the LSD (Latvian Social Democracy) in Tukums. In the summer of 1905 he took part in many of the so-called “church demonstrations” in Kurzeme, and was very much respected as a good speaker. Later he became the leader of the LSD Riga Fighting Organisation, planning and personally taking part in all the major operations carried out by the fighters, among them the attack by 52 men on the Riga Central Prison in October 1905. As well as in the famous attack on the building of the Secret Police Department in Riga in January 1906, during which Fricis Svars was liberated. After that Zhaklis went to Finland, where together with Gederts Eliass, who later became a well-known artist, but in those days was just as well known as a fighter, and several other men, he organised and carried out the expropriation of the Helsinki Bank. The greatest part of the money went to Vladimir Uljanov, or Lenin. Still, already in 1906, differences of opinion appeared between the Social Democrats and Janis Zhaklis. 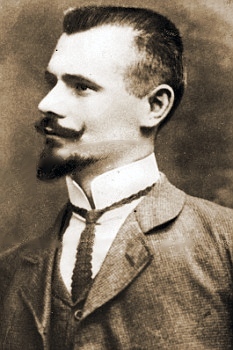 The wish of the LSD to abandon armed struggle (in favour of a parliamentary discourse) was unacceptable to Zhaklis, and together with 10 other former Social Democrats he founded a communist anarchist group “The Same - in Word and Deed!” (“Pats - vards un darbs!”). His “desertion” and conversion to the camp of “mensheviks and anarchists” could be the reason why in the Soviet times his activities were not particularly studied and noted. After two members of this group, Anna Caune and Karlis Krievin’sh were killed by the police in a siege in Stabu Street, Janis Zhaklis, Svars, Hartmanis and others escaped abroad. Of course, the expropriation of the Helsinki Bank and the subsequent expropriations in the U.S. and Great Britain can be considered as ordinary robberies - and still personal enrichment was not the fighters’ goal. Almost all of them had left family behind in Latvia, many relatives were left without a breadwinner after the events of 1905. From 1908 till 1913 an anarchist journal “Briviba” [“Freedom”] was published in New York, and from 1911 till 1914 “Melnais Karogs” [“Black Flag”]was published in Paris. Alongside with calls to ensure social justice and do away with governors and rulers, “Melnais Karogs” published articles on the right of nations to self-determination and independence. If not for the unsuccessful robbery in London, it is possible that the legend about Peter the Painter and his mates would never have been born. Even though there is little evidence to support this, it is quite probable that the expropriations which they had carried out before then were successful and did not cast any suspicion on them. Sokolov had worked in various jewellery shops - and every time he would leave a job for a new one, the previous shop would be robbed. He was even questioned by the police in this connection, but they couldn’t prove anything. (They didn’t notice anything suspicious). Philip Ruff is full of determination to get to know about the later period in the life of Peter the Painter / Janis Zhaklis. Neither his name, nor the names of any of his relatives or comrades are mentioned in the lists of participants in the 1905 revolution, which are kept in the museums of Talsi and Kuldiga. Our only findings consisted of the golden light of early autumn, the blue-black clouds on the horizon, the smell of apples in the car, some maple trees already reddened by the night frost, the smell of burning grass and the numerous potato diggers along the Kuldiga roadside… Nothing else. P.S. Philip Ruff continues to look for information about the youth of Janis Zhaklis (Mernieks, Peter Pjatkov) and would be grateful to receive any information about him or his family, as well as about Fricis Svars and other Latvian anarchists. From: "SestDiena" (Riga), October 11th 2003..